Modeling Suite… MPro+: Our most popular products. It enables IBIS and IBIS-AMI model generation and general modeling capabilities. Comparable offerings by other vendors costs two to three times more. Analysis Suite… VPro+: SI, tr0, snp, ibis viewer, S-parameter analysis and compliance checking, Transmission line modeling and analysis all in one suite. Free suite…SPISimLite: Free SI, tr0, snp, ibis viewer and analysis tool. SSolver simulation up to six system devices. SPISimLite is complementary during licensed period with any paid/activated module. 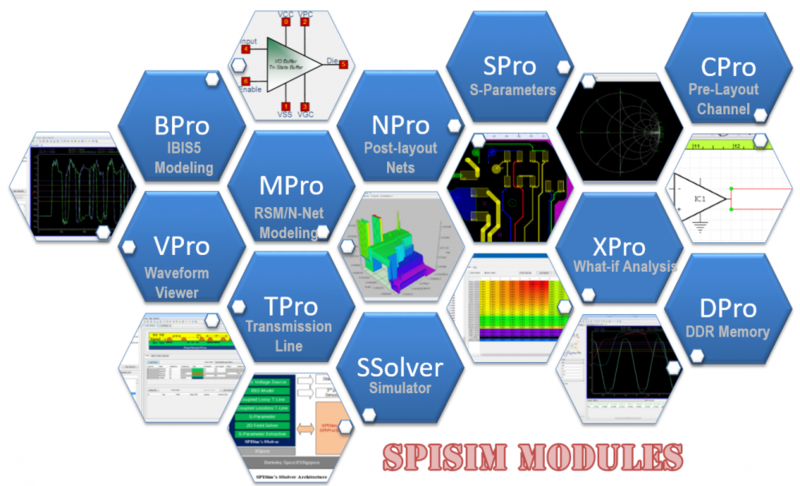 Add-on modules: The following modules include all the SI/PI/simulation/modeling offerings from SPISim. Individual modules may be activated independently to enable specific capabilities. SSolver: Spice simulator and s-parameter extraction. For contracted project and group purchase, these existing capabilities may be further customized to meet your organization’s need.